Shongololo Express - an epic 12 day train journey through Southern Africa! 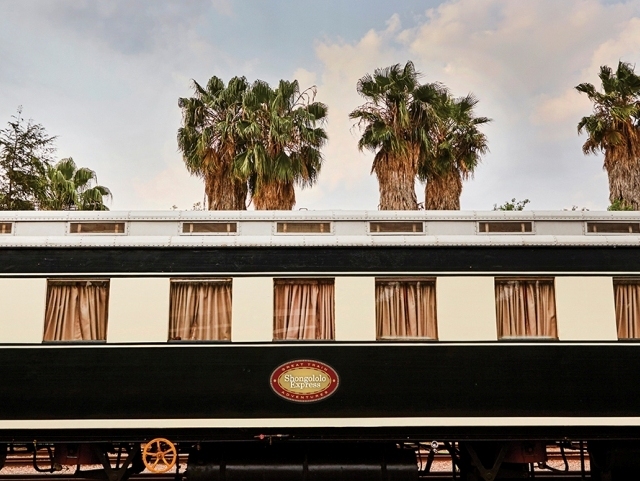 The privately owned Rovos Rail run 3-star epic train journeys through Southern Africa. 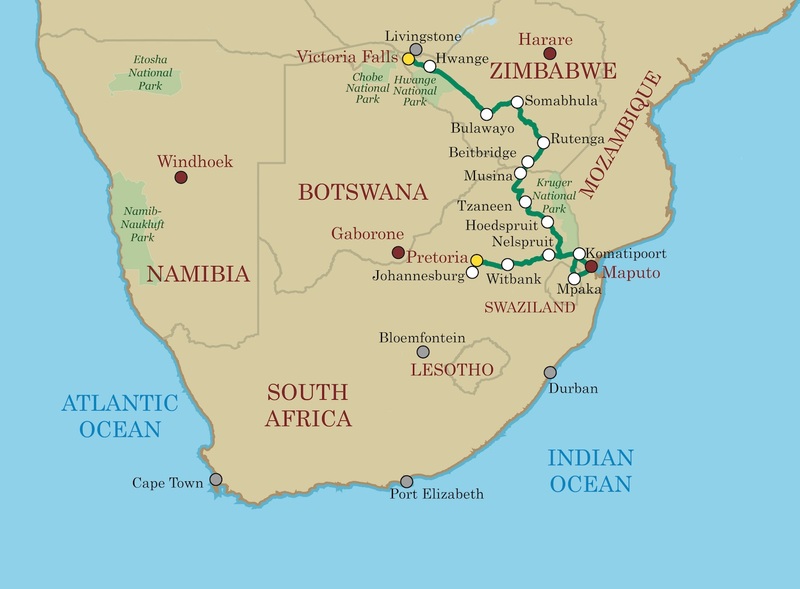 The South African company known for the luxurious Rovos Rail train trips took over the Shongololo Express trains in 2016, and offer long trips of between 12 and 15 days through South Africa, Zimbabwe, Swaziland, Mozambique and Namibia. 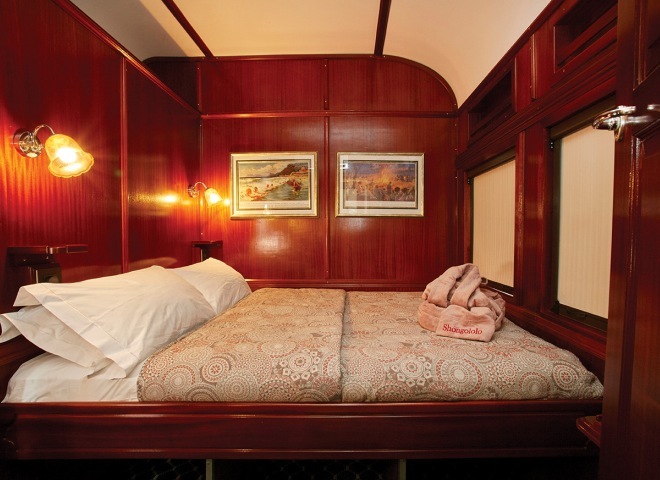 And although it is not the 5-star experience, the trips are still luxurious rail safari experiences. As far as African train safaris go, the Shongololo Express offers so much excitement in amazing destinations at a more reasonable rate considering offerings and length of the trips. 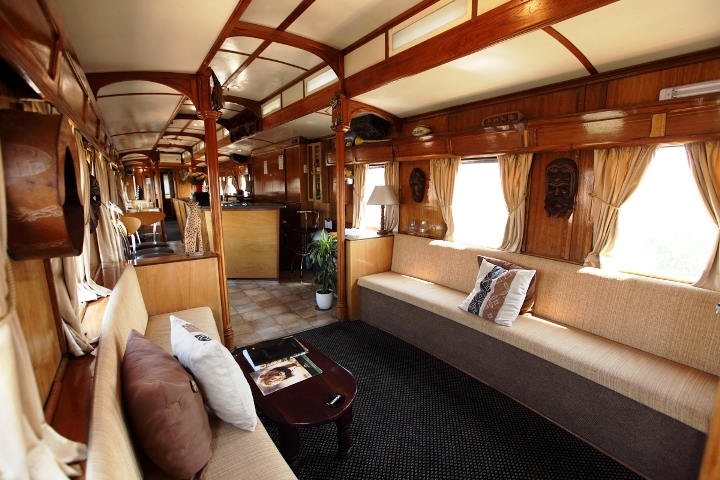 A rail safari really is an ideal way to travel, especially through southern Africa. 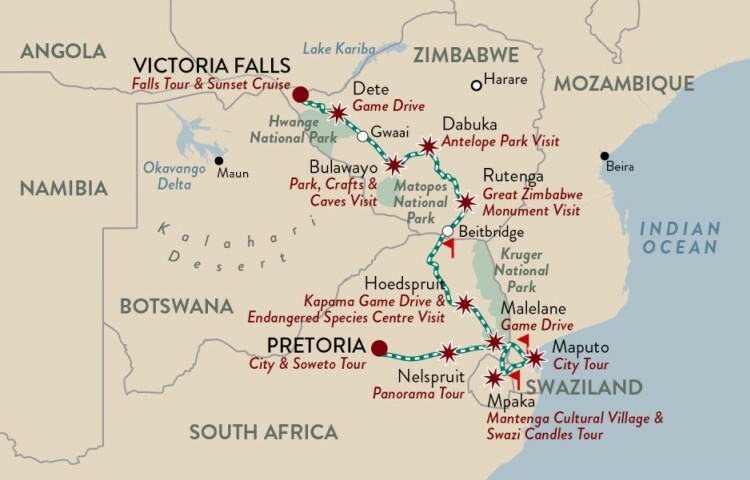 Take a tour with a difference from Pretoria to Victoria Falls and/or the other way. The Southern Cross trip is a 12-day journey, and can be combined with awesome adventure in Victoria Falls at the beginning or end of your holiday. In this trip, you will experience the vast scenic landscape of South Africa, Swaziland, Mozambique and Zimbabwe while you retreat back to your cosy cabin and other lodging along the way. Romance, culture, history, adventure, wildlife and true African hospitality are things that you can expect during your trip on the Shongololo Express. Take this tour while on honeymoon, celebrating an anniversary, or as a family wanting to explore the beautiful African landscape. The Shongololo Express takes guests on various off-board excursions (the same concept as with cruise ships) often in their air-conditioned vehicles, or 4x4 game vehicles, which also travel with the train. Professional multi-lingual guides take you for the various activities during the day and you return to the train well before dinner (sometimes by lunch time), so the train mostly travels during the night so that passengers wake up each morning at a new destination! -Return to the train in Bulawayo which will head for Dabuka. - Return to the train and depart for Bannockburn. - Depart in vehicles from Mpaka, Swaziland for visit to Swazi Candles, Mantenga Cultural Village and Mantenga Lodge. - Return to the train and travel towards Beitbridge, crossing the bridge to Messina and overnight there. - Morning game drive in Kapama Game Reserve, visit to the Hoedspruit Endangered Species Centre. - A travelling day on the train as it traverses Limpopo and heads towards Hoedspruit. - Return to the train for lunch. Depart for Mpaka. - Visit Swazi Candles, Mantenga Cultural Village and Mantenga Lodge. - Take a ride to Antelope Park for the day. - After border formalities the train heads for Malelane for the overnight stop. - Rejoin the train in Nelspruit and depart for Witbank. While on a trip on the Shongololo Express, you will be taken for a tour of the largest waterfall in the world and of the town that has grown since its discovery by outside world. 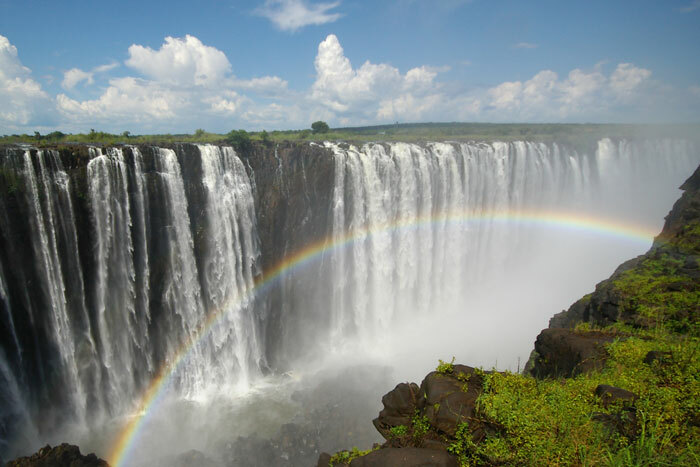 However, there are so many more Victoria Falls activities on offer from blood-pumping white-water rafting and bungee jumping to scenic helicopter rides, wildlife and specialised tours and activities. 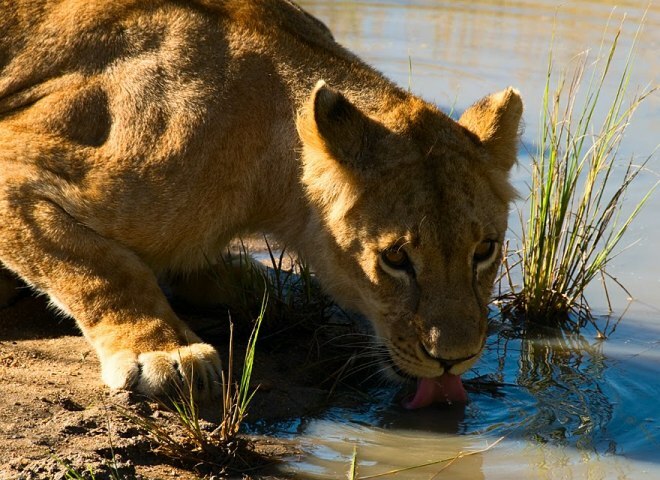 We also recommend a day trip (or if you prefer an overnight Chobe camping safari) to nearby and impressive Chobe National Park in Botswana, to really make the most out of your stay in Victoria Falls! The Shongololo Express train consists of two dining cars which are air-conditioned and non-smoking and serve breakfast, lunch and dinner; a bar car, and an observation car with open air balcony at the back of the train - best for sight-seeing. 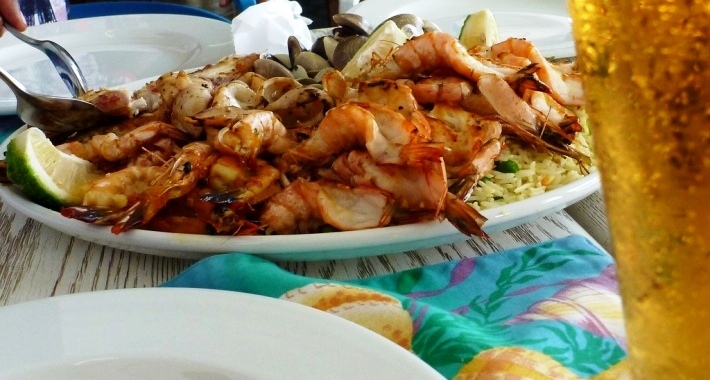 A maximum number of 72 guests can be accommodated in two cabin categories - Gold and Emerald. Both cabin types have double and twin configuration but differ in size - the Emerald being larger than the Gold cabins. 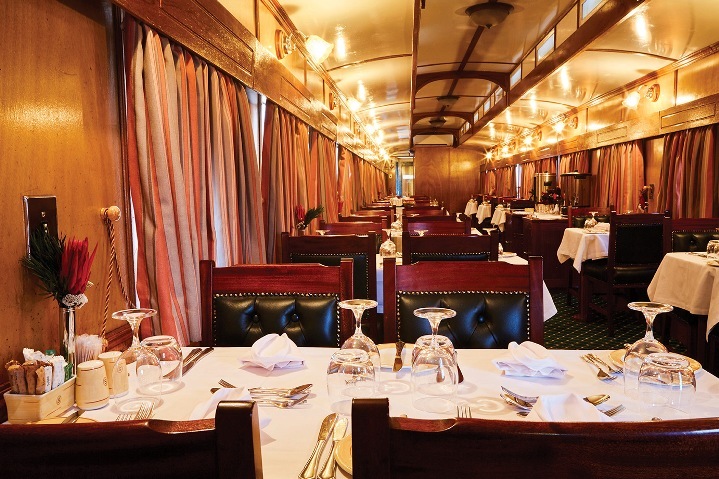 • The dining carriages are air-conditioned and non-smoking. The total seating capacity is 72 and dress code for meal times is casual. Lunch is for guest’s own account except when otherwise stated. Meal times on the Shongololo Express depend on the activities planned for the day, but are generally served at the following times: Breakfast 07h00-08h30; Lunch 13h00; Dinner 19h30. • When taking trips off the train, guests are encouraged to wear comfortable walking shoes, sunglasses, sunscreen and a hat for the outside activities. Warm clothing is essential for the games drives as those are conducted early in the morning when it is still quite cold. • Make sure that you have your valid passport with you with a valid visa (if applicable). Be sure to check your itineraries so that you know which countries you will pass through, and arrange for visas as required. Make sure that you have at least 3 blank visa pages in your passport for border stamps, and that your passport will be valid for at least six months from your return-home date. • Anti-malaria preventions medication is recommended if you are travelling to Swaziland, Kruger Park, Northern Botswana, and Zimbabwe (especially Victoria Falls and Hwange). Yellow fever certificates may be required if you are coming from Tanzania. • For your curio shopping, gratuities, lunches, etc, you will need to bring some cash on your trip. Although some places may allow you to use a credit card, small traders and rural sellers will not have point of sale machines. Some areas will not have ATMs or in worst circumstances, they may not be working. You are advised to carry South African Rands, US Dollars (in small denominations) or Euros (bank notes). In South Africa only Rands may be used. In Zimbabwe, Namibia, Mozambique, Swaziland and Botswana it is possible to use US Dollars. • It is compulsory for all guests to provide proof of comprehensive travel insurance including but not limited to medical cost, emergency evacuation and repatriation, cancellation or curtailment, loss of baggage, personal possessions or money. • You may want to bring along a travel adapter as the train has South African 3-pin round plug socket. Note: There is no phone on the Shongololo Express train. Also, don’t expect to get full mobile phone coverage, especially while the train is in motion or stopped in the remote game parks. However, you may be able to connect to the internet at some of the local internet cafes along the way. • Children over 10 pay the full rate. • If you are starting this exciting trip in Victoria Falls, you will need to get to Victoria Falls Hotel for check-in on the morning of the departure date. • Should you be coming from Pretoria (South Africa), you will need to check-in at the Rovos Rail Station on the morning of the departure date. For a shorter and more luxurious journey to Victoria Falls by train, try the Rovos Rail!